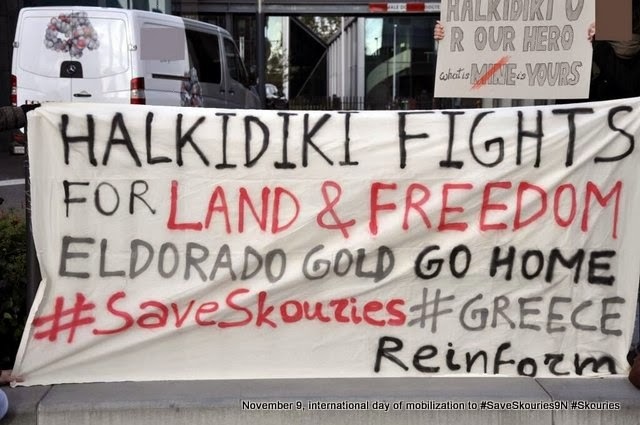 On November 9th 2013, thousands of protesters in dozens of marches took the streets around Greece demanding that the Skouries forest is saved from toxic gold mining and that the prosecutions of the people resisting the extraction are stopped. 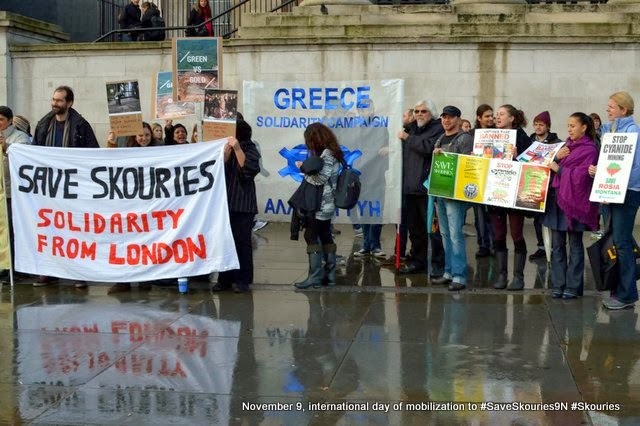 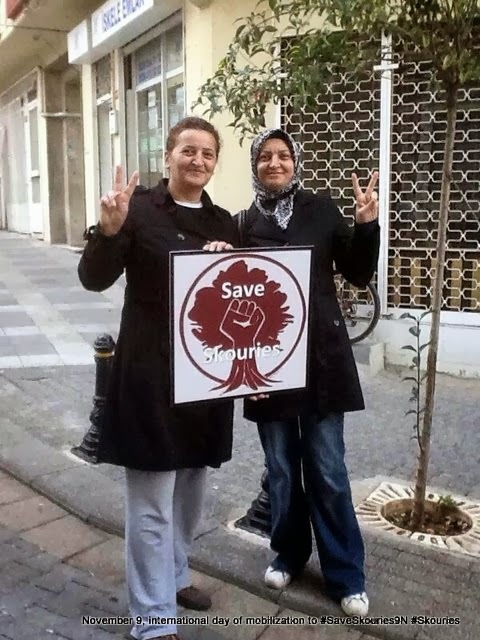 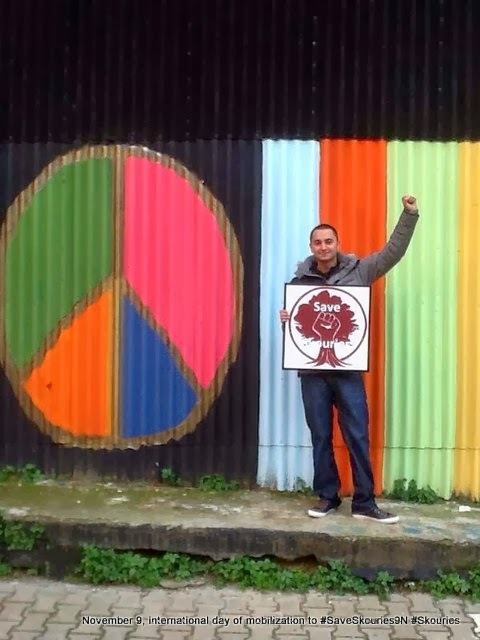 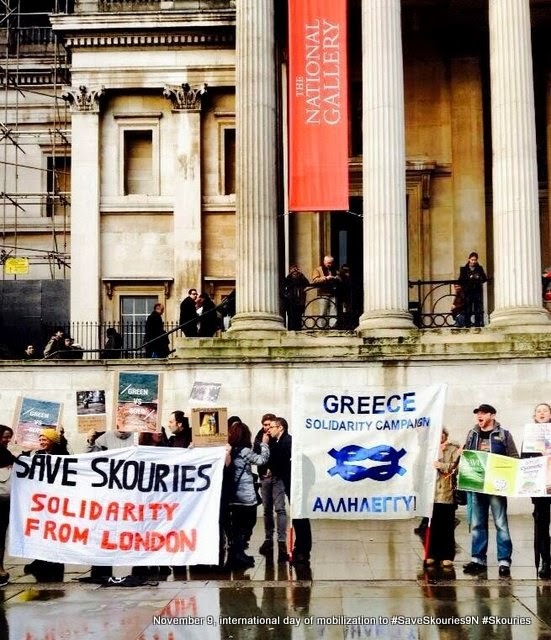 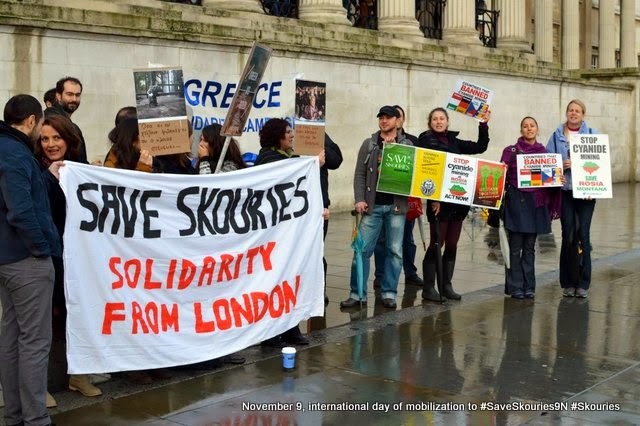 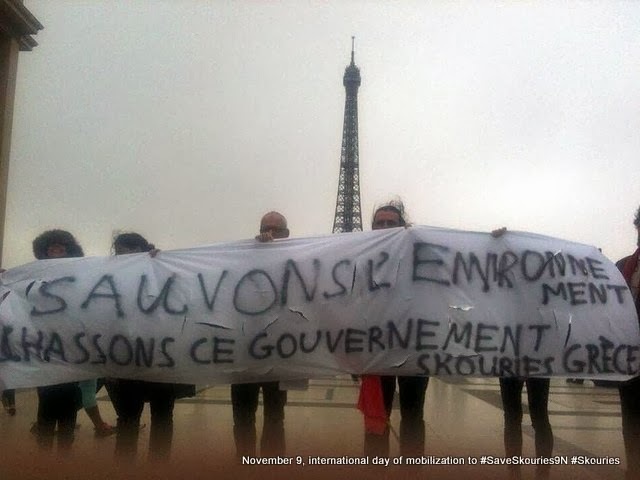 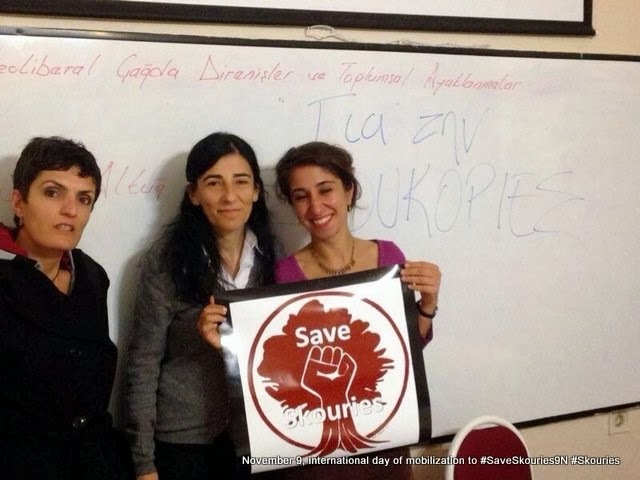 At the same time, several events were organized around the world in support and solidarity with the Skouries struggle! 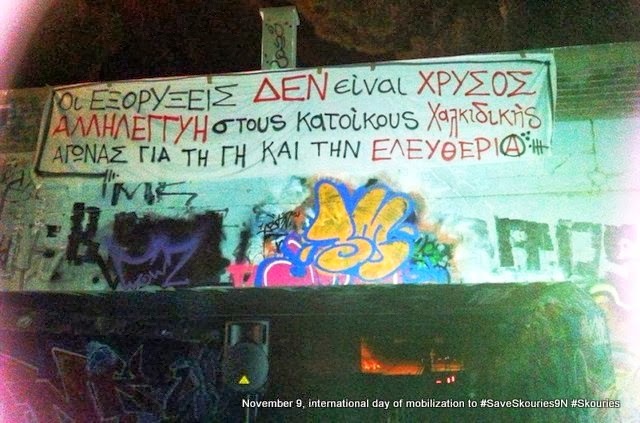 The message is clear: We are not "extremists", as the Greek government would have it, we are everyday people of all ages, social groups, creeds and nationalities, united by the love for our land, our forests, our water, united by our desire to safeguard this planet for the sake of our children, united by our resistence to a commodifying view of nature that puts individual profit over collective welfare. 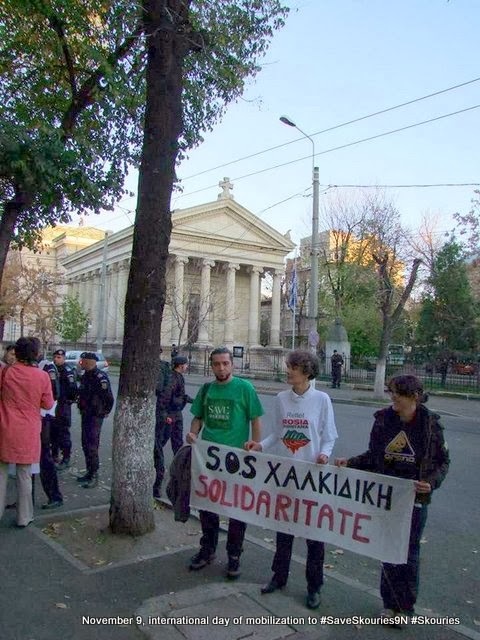 In Bucharest, Romania, where the people have a struggle of their own to save Rosia Montana from a similar disastrous mining project, protesters raised banners outside the Greek embassy. 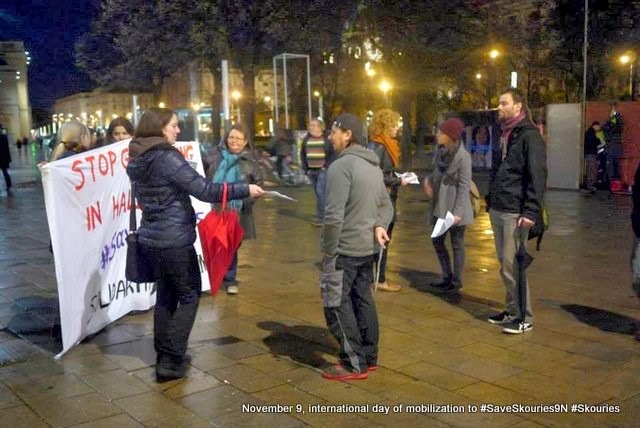 In Cluj, Transylvania, Romania, very close to the Rosia Montana mine development, activists gathered in a central square, displayed banners of solidarity and handed out leaflets. 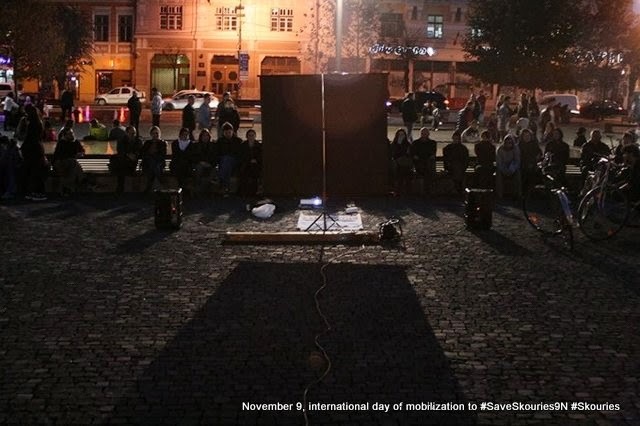 After the sun was down they screened a documentary detailing the Skouries conflict. 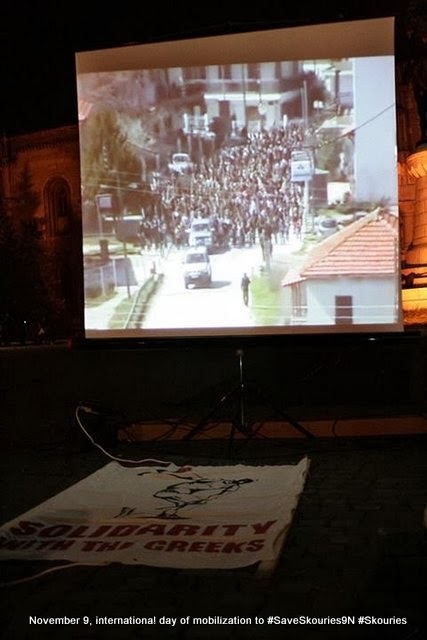 Banners were also displayed in other places in Romania. 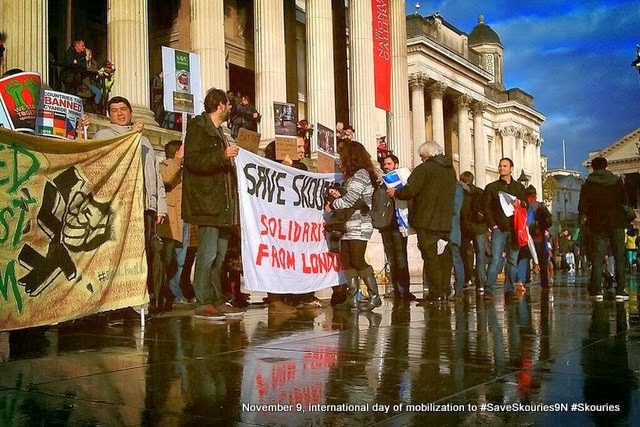 In London, U.K., the protesters against the Skouries gold mine joined forces with those defending Rosia Montana. 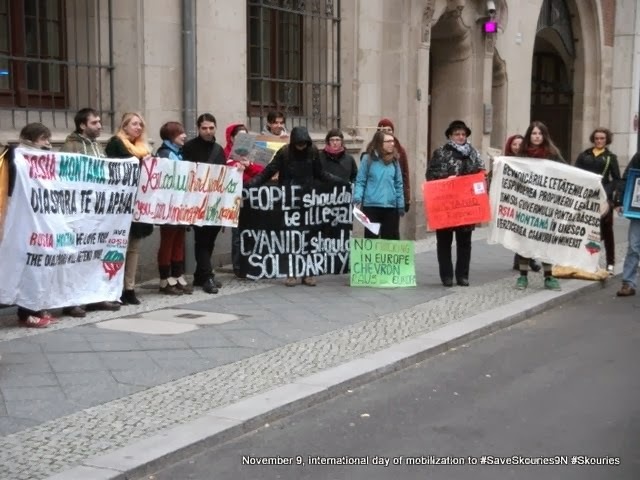 They marched together to the Canadian embassy to protest the two disastrous mining projects promoted by Canadian companies Eldorado Gold and Gabriel Resources respectively. 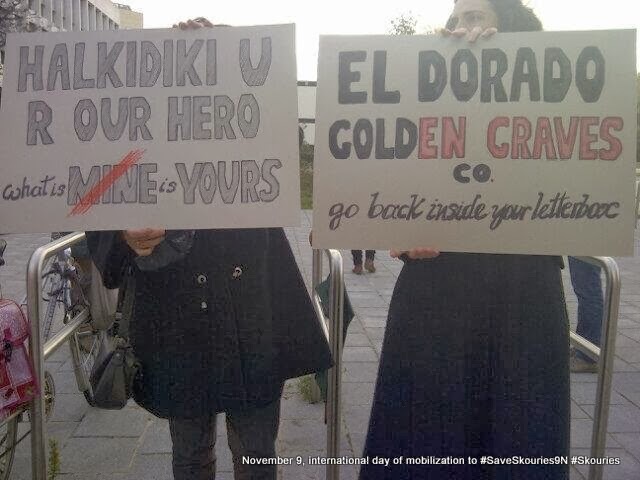 In Istanbul, Turkey, in a country also affected by Eldorado Gold’s disastrous activity (Kisladag and Efemcukuru gold mines), solidarity banners were displayed around the city. 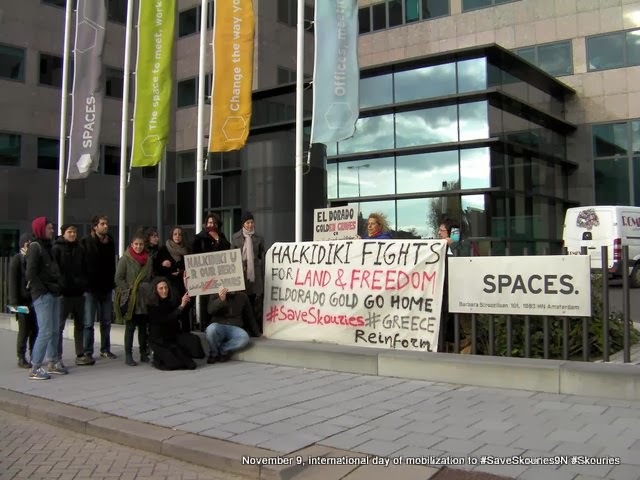 In Amsterdam, The Netherlands, a solidarity group managed to find the letterbox that serves as Eldorado Gold’s subsidiary Hellas Gold “headquarters”. 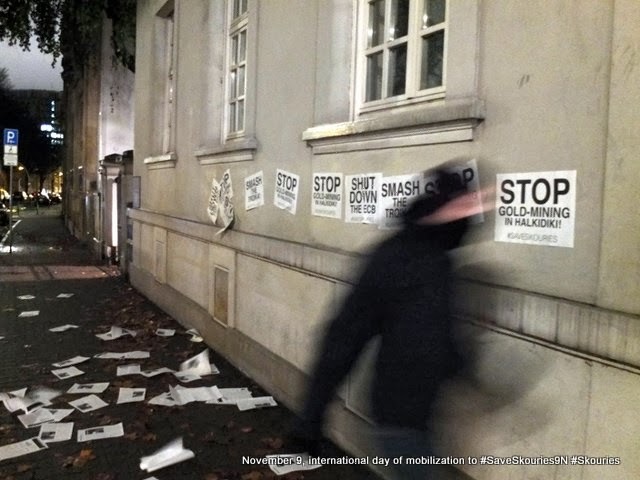 This practice is common for multinationals in order to take advantage of Holland´s tax breaks. 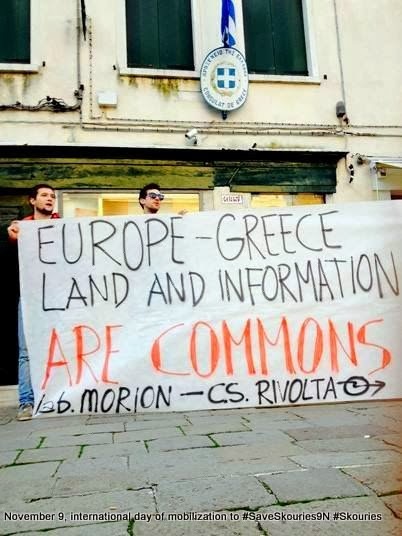 In Venice, Italy, activists protested and held a banner in front of the Greek consulate. 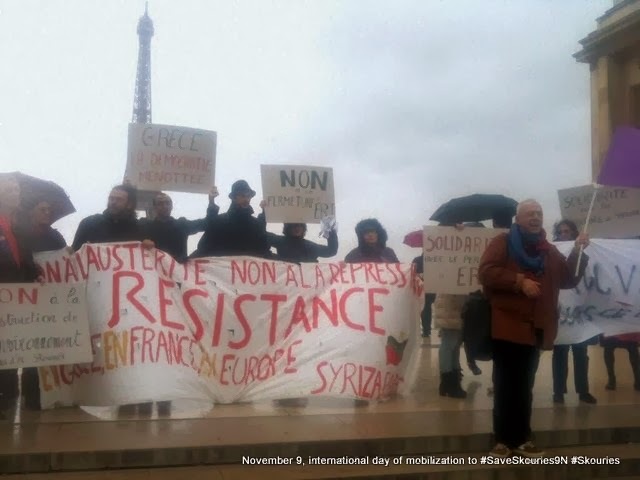 In Paris, France, protesters ignored the rainy weather to hold solidarity banners against the backdrop of the Eiffel tower. 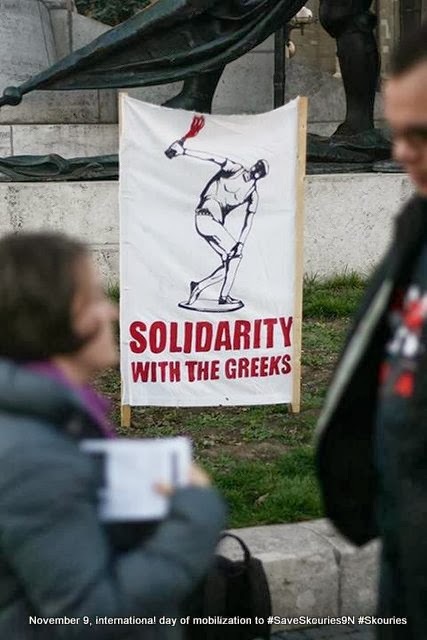 Slogans of solidarity with the workers of ERT, the public broadcaster that was raided by riot police on November 7th, were also displayed. 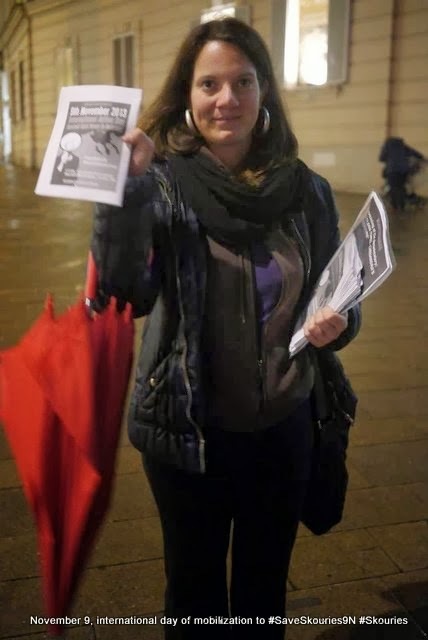 In Vienna, Austria, a group of people raised solidarity banners and handed out leaflets to the passers-by. 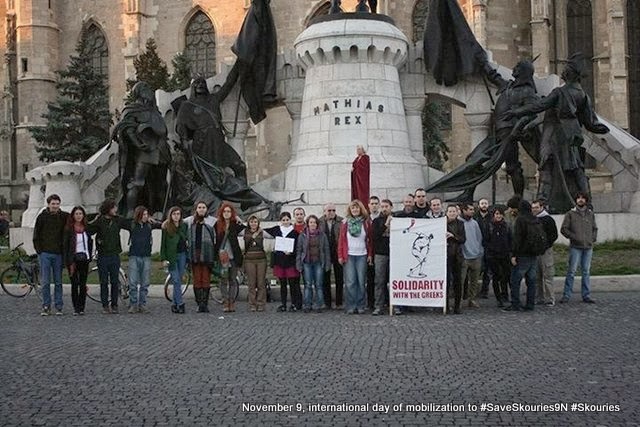 They were also joined by people protesting the destruction of Rosia Montana in Romania. 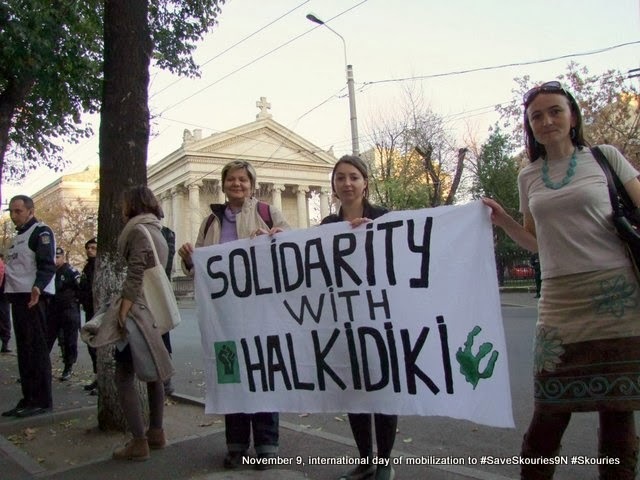 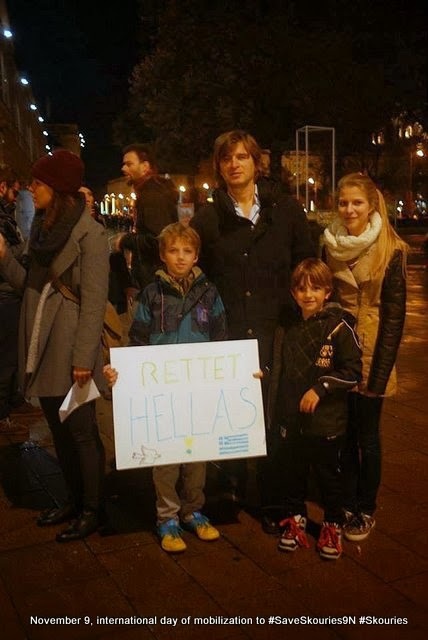 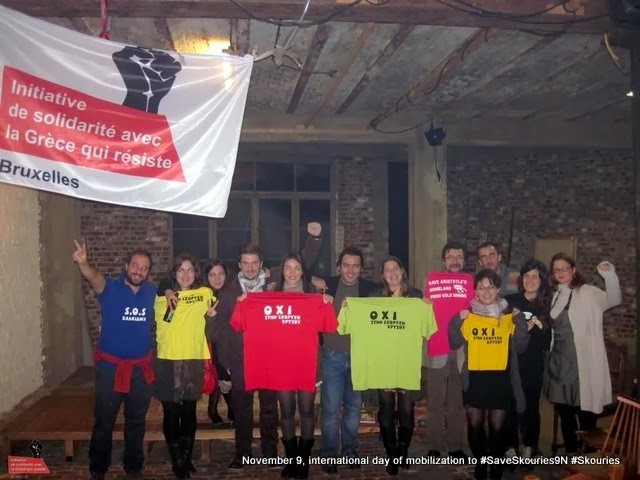 In Brussels, Belgium, a solidarity group protested against Skouries by displaying with pride their “SOS Halkidiki” T-shirts. 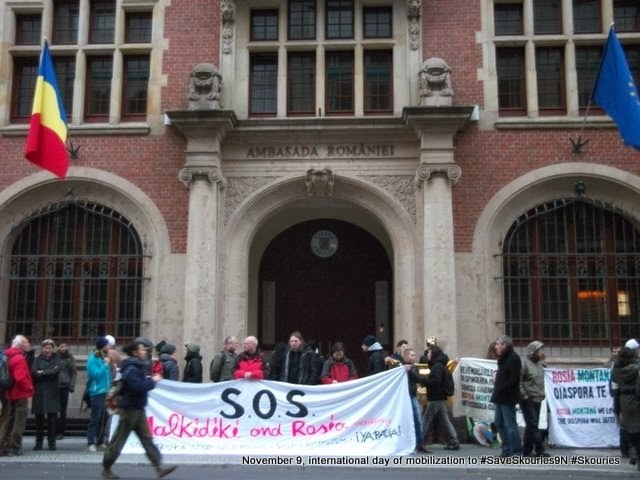 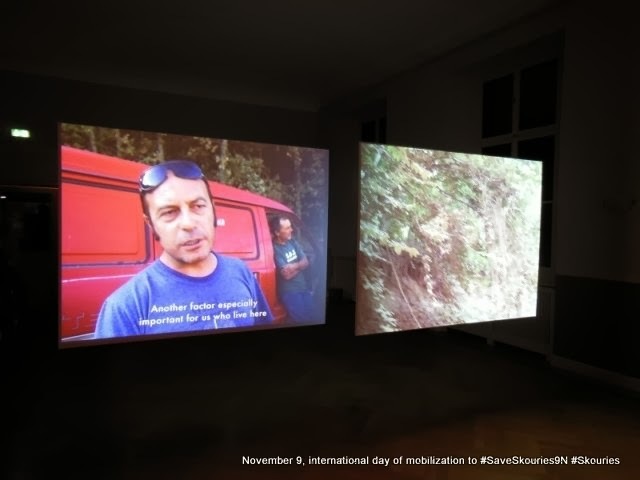 In Berlin, Germany, there was also a joint mobilization for Skouries and Rosia Montana! 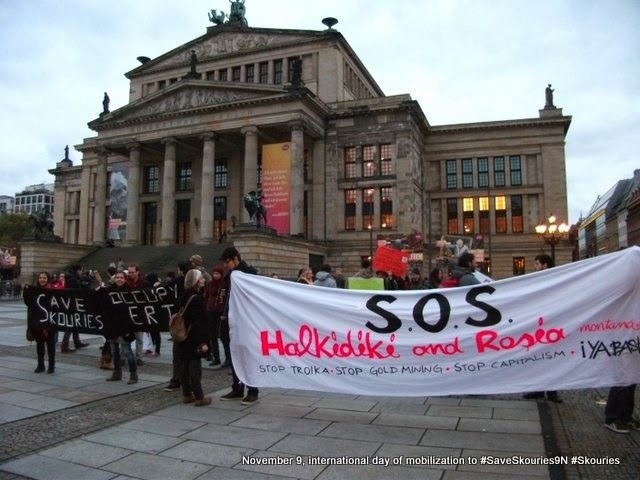 The protesters gathered at the Romanian embassy and then moved on to the Gendarmenmarkt square. 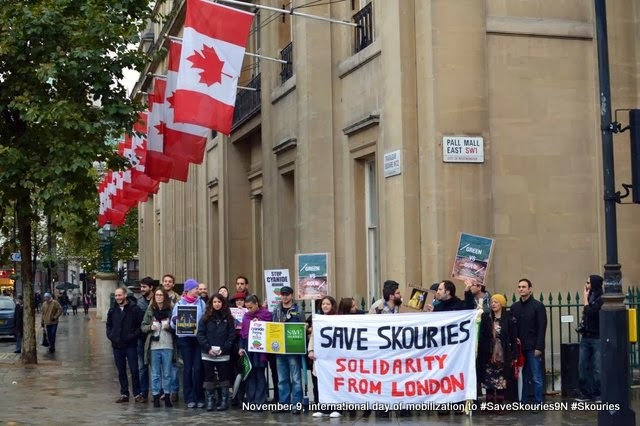 There a banner was raised and the road movie “Corridor X“, detailing the Skouries struggle, was screened. 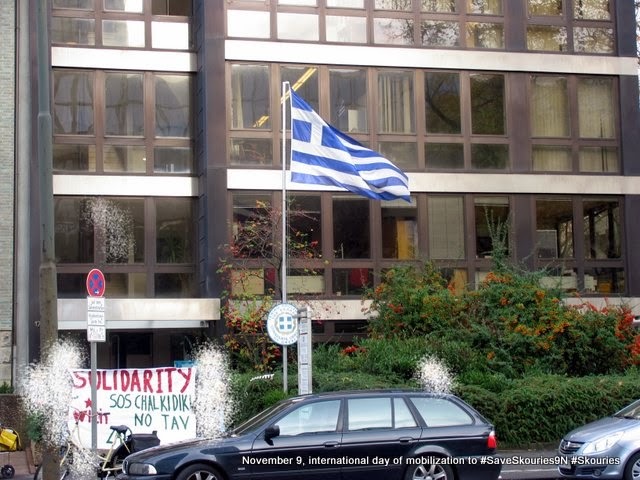 In Frankfurt, Germany, solidarity messages were posted across the road from the Greek consulate. 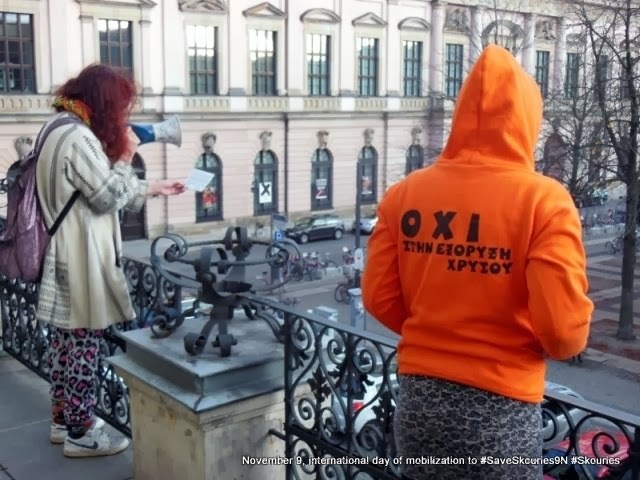 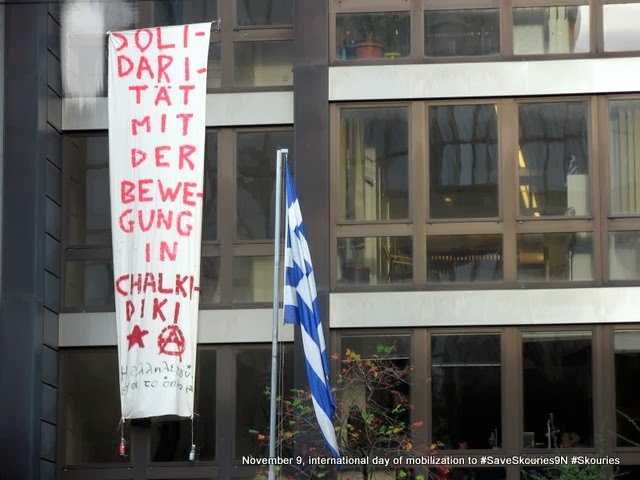 In Dusseldorf, Germany, protesters symbolically occupied the Greek consulate and hung a solidarity banner. 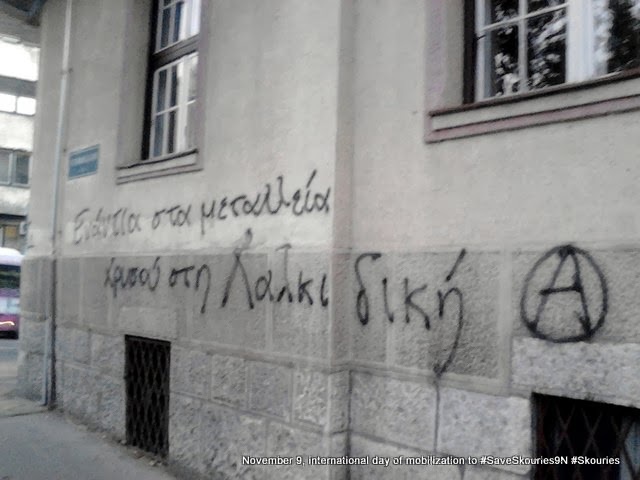 In Belgrade, Serbia, a solidarity slogan was spray-painted across the road from the Greek embassy. 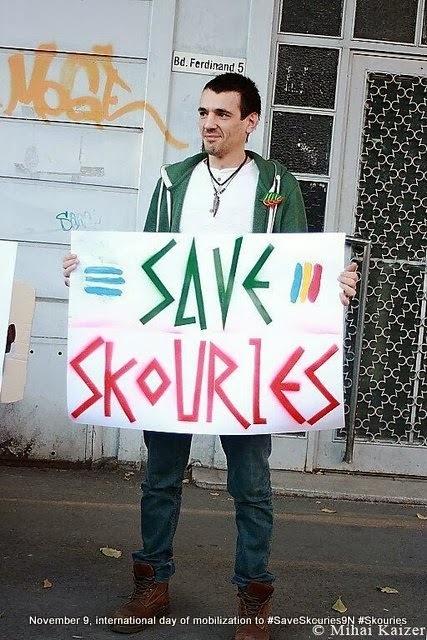 In Skopje a banner was held outside the Greek embassy in solidarity with the struggle of Skouries. 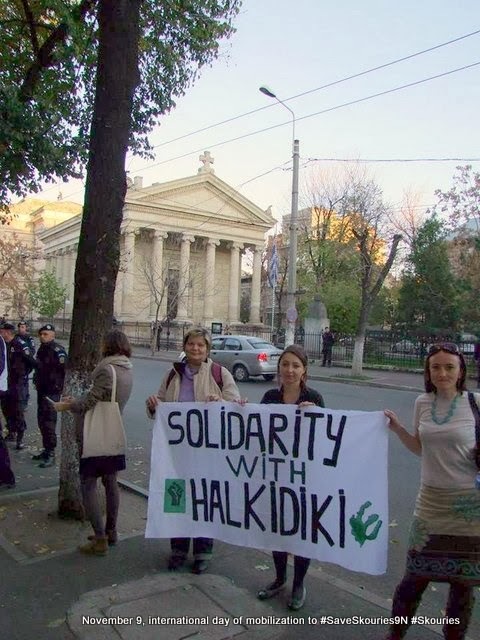 In Sofia, Bulgaria, a large group of protesters gathered outside the Parliament to protest the mining offensive around the Balkans. 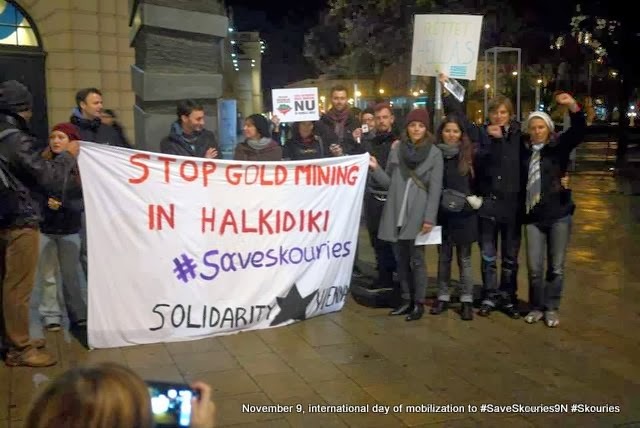 Apart from Skouries, they gave visibility to the mining conflicts in Rosia Montana in Romania and Zlatitsa Etropolje in Bulgaria. 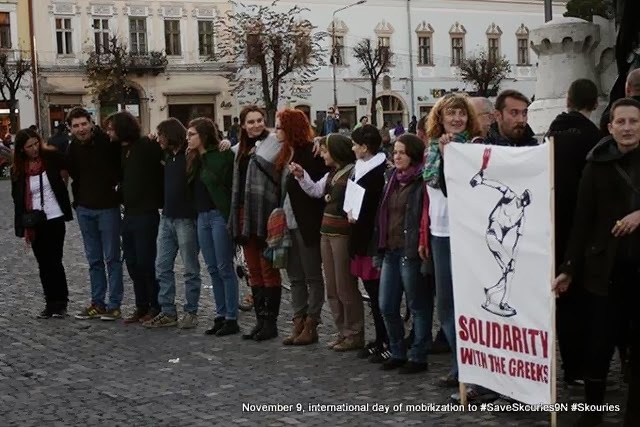 They then marched to the Greek embassy, where they protested chanting slogans and displaying banners both in Bulgarian and Greek. 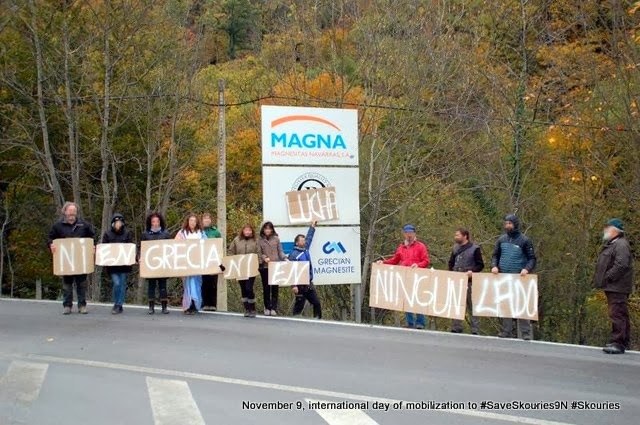 In Navarra, Spain protesters from Lakaba community targeted a local open-pit megnesite mine, which is incidentally has a Greek company as majority shareholder. 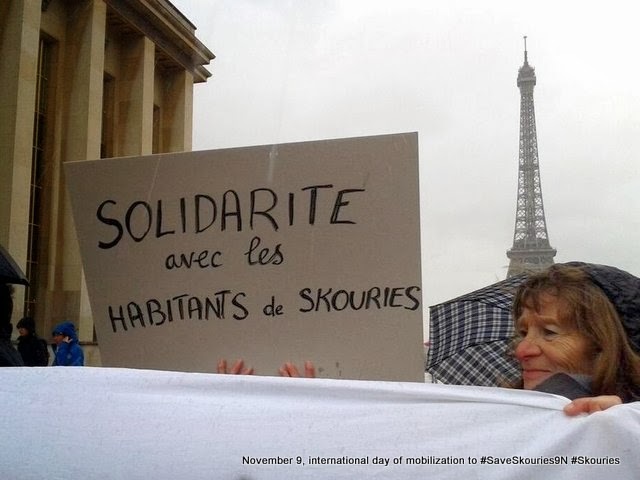 They displayed a solidarity banner and they exchanged information with the residents of nearby villages that oppose the magnesite extraction. 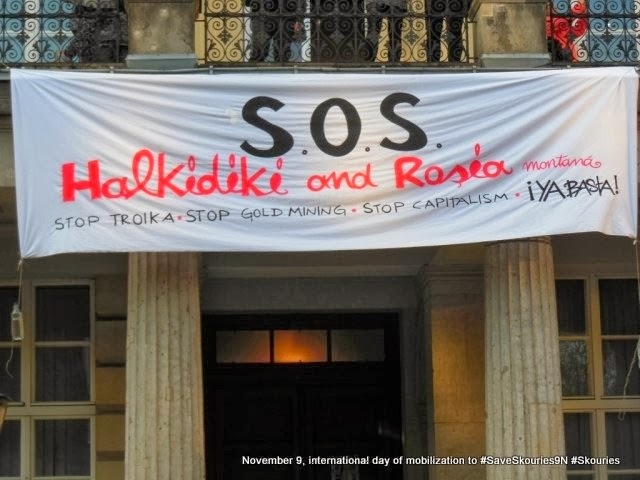 In Nicosia, Cyprus, a solidarity banner was displayed.